Today's date, what is the date today? View calendars that can be printed. Log in to online calendars. Check the weather. 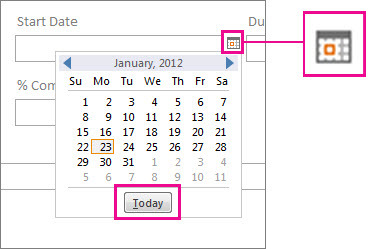 On an Access form, use the Date Picker to enter the current date. If the field is set up as a Date/Time field, the Date Picker icon appears when you click in the field. Click the icon, and then click the Today button below the calendar.